Has Geocaching finally peaked, and on the decline? That depends on how you define “on the decline”. If it were defined as the number of new caches created by year, we’re afraid the answer is yes. Here you see a bar graph of caches created by year on our website. Note that caches created doesn’t necessarily mean all of them were published, but 98%+ of them were. Keep in mind our site was launched in mid-August 2010, so there was quite a bit of interest in the new website to have 527 caches created in just 4 1/2 months. Then we had a somewhat unexplained decline in 2011, and we peaked in 2012. You can see where the numbers have gone from there. It’s not just us though. 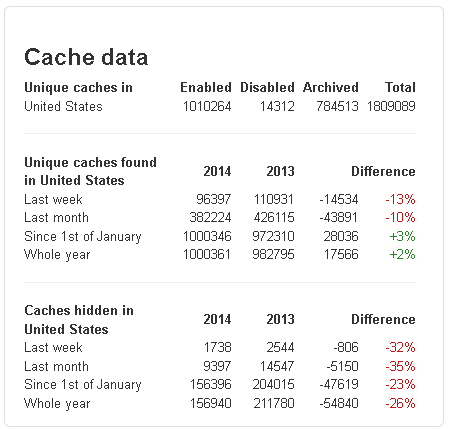 With 3 weeks left in 2014, new caches hidden in The United States in 2014 are down 23% from their 2013 levels on Geocaching.com, as well as being down in most Countries in the world that are considered traditional hotbeds of Geocaching activity. However, there are a few Countries that are exceptions to this overall decline in caches hidden, and there is some good news regarding the number of new Geocachers, and the overall number of caches being found. Geocaching.com most likely would not release a similar bar graph of caches hidden by year, and most certainly not to the blog for a Geocaching website they consider to be a competitor, although we are obviously small potato’s compared to them. But using the website Project-GC.com, one of their “authorized API partners”, you can compare the number of new caches hidden in The United States (or any other Country) in 2014 vs. 2013, a screen shot of which we see here. We find it hard to believe this isn’t the first year there has ever been a decline in the number of new caches hidden since the inception of Geocaching in 2000. And you can see the November and December numbers are down even more, over 30% apiece. Keeping in mind that, in order, the Countries with the most caches hidden on Geocaching.com are The United States, Germany, Canada, The United Kingdom, and Sweden; the hidden numbers are down in 4 of the top 5. Data per Project-GC.com, 12/9/2014. Looking again at the Cache Data screen shot above from project-GC.com, you will see that unique caches found in the United States is up in 2014, although only a 3% increase from 2013. Obviously, more people are finding caches than at any time in the history of Geocaching. Geocaching.com has seen just under 3,000,000 of their more than 11,000,000 accounts created in 2014! “Active cachers” in and from the United States as defined by Project-GC.com, and queried 12/9/2014, have shown a 42% increase in 2014 from 2013 levels. We here at OCNA have seen a major spike in accounts created as well; in our a year of OpenCachingNA Analytics blog post, we stated that over 1/3 of our accounts were created in the one year period from May 15th, 2013 to May 15th, 2014. However, the number of finds on our site has remained relatively steady over the years. Are we sounding the alarm? For our own website, yes! We must need more contests. 🙂 For Geocaching.com, we find this an unprecedented trend, which will be interesting to watch. Will the number of hidden caches continue to fall in 2015 in the Countries traditionally known as hotbeds of Geocaching activity? Will the number of cache finds, and the number of “active Geocachers” continue to increase? There are over 2.5 million active Geocaches, and only one person in the world has found over 100,000 of them, although 2 other people should easily join that club in 2015. 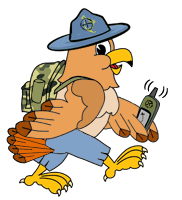 We certainly are not going to run out of caches to find anytime soon! Have you noticed this trend of less new caches being hidden in your area? Feel free to comment to this post. The OCNA blogger most certainly has noticed this in his area, and his email inbox has been quite lonely for months! Thanks for the insights, really interesting reading. in the game, and don’t feel they need to do any but complain about a cache, when something as simple as adding a piece of paper to use for a log until the CO or another caring cacher adds one. As an example, a cacher with over 10,000 finds left such a note. There are fewer “quality” caches being published in my area. In fact there are fewer caches of any type published in my area. The group I grew up caching with is fading. They were what I would consider the 2nd generation of cachers. Not the Pioneers that seeded the area with it’s first caches but the group that followed when there were actually a rather large number of caches, both urban and woodland. When GPSR’s became more common and even an auto GPS could be used to find a cache. When true creativity in cache creation was paramount but numbers were all the rage. Now there is only the curiosity interest which is driving the number of new cachers and initial finds with their phones before losing interest. If their interest persists then there are limited areas for their first few hides driving down the numbers and with their limited experience they tend to hide less creative hides bringing less interest in finding them. Over time the best hides and their hiders will leave the system as they become disillusioned with the latest phone cachers logs and their caches come into disrepair, damage and disappearance. Over time the short term participants will drive down the quality of caches remaining with a lack of creativity followed by a lack of repair before they are archived. The older generations will tire of the new guys inability to find what they thought was a reasonable puzzle and their lack of care for what they find. The more long term players will tire of repairing quality caches that are misplaced, stolen or otherwise damaged by this less caring group and fade away as my current peers are doing and as the previous generation did for us. This is probably a good thing over all. In the end only those that are truly dedicated or otherwise interested in the activity will remain with the occasional influx of the next generation testing the waters to see if it is for them. Those that persist will leave their mark in one way or the other be it threw their caches or their logs. Their participation in the activity as it existed in their time or their less active but long term participation in the game. I just posted another cache on opencaching.com and for the first time ever in my experience there were no other caches waiting to be peer reviewed. Where did everybody go? I think it’s a shame that Garmin does not seriously challenge Groundspeak. Monopolies are never good and GC could easily become a ‘dictatorship’ without a credible alternative. Munzee seem to be evolving fast too though and, although different to classical geocaching, must be sucking some new players away. Where do you guys publish? On Garmin Groundspeak or both?